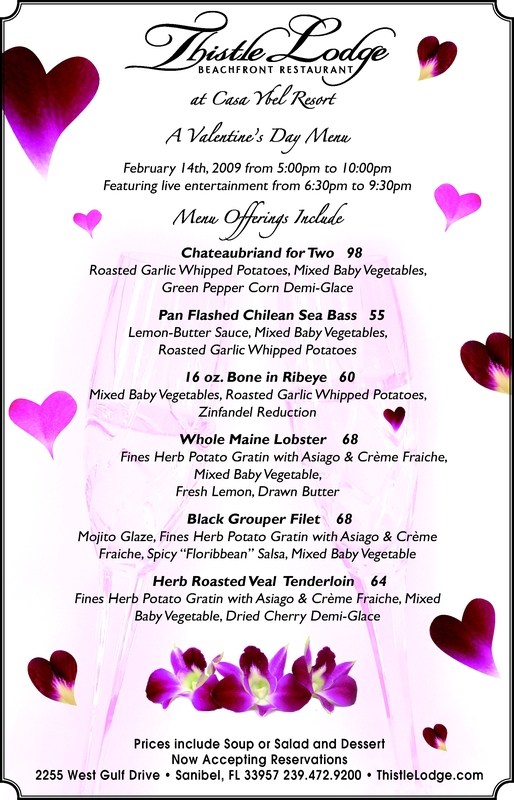 It’s time to make plans to celebrate Valentine’s Day at the most romantic restaurant on Sanibel Island – Historic Thistle Lodge at Casa Ybel Resort! Beachfront dining and live entertainment along with a special menu of exquisitely prepared food is guarenteed to make your special evening one you will always remember. Click the image to the right to see the Special Holiday Menu. Dinner will be served for 5:00 – 10:00pm. Reservations are required. Categories: Casa Ybel Resort, Special Event, Thistle Lodge | Tags: beachfront dining, Sanibel Island, Valentine's Day | Permalink.